Memory is a funny thing. It speaks to us from far away, sometimes clear, sometimes hazy, sometimes not at all, forming and reforming our identity as we age, a testament to the journeys we take and of our transient nature as human beings. Even more fascinating, it’s completely unreliable, affected by dreams, imagination, and experience. Most of what we remember probably did not occur the way we remember it, for memory is just a prism, a version of the truth to which we add, delete, or modify, sometimes consciously and sometimes not. 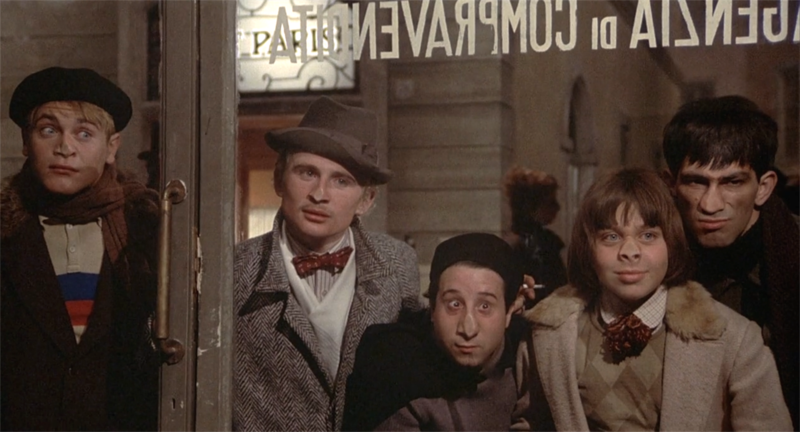 Federico Fellini’s Amarcord is about memory, particularly his recollections of growing up in a small seaside village. Even the title literally means I Remember in the Italian dialect of Romagnol. But, as befitting a Fellini film, it’s not a straight dive into sentimentality, but rather something more complex and fragmented. Augmented by his usual dreamy, surrealistic touches, Fellini shows us a year in the life of a town in 1930’s Italy: The bonfire signaling the beginning of spring; the gang of school delinquents giving their teachers hell; the unmarried local beauty (Magali Noël) longing for Mr. Right; the family dinners that end in shouting matches; the excitement over a Fascist parade. None of it feels particularly real… and yet it does, as if waking up from a long sleep. In Amarcord Fellini shows evident wistfulness for a time and place long gone, even though it’s anyone’s guess how much of it actually happened. Whether lampooning Il Duce himself (“Mussolini’s got balls this big!”) or staging a hilarious encounter between a virgin teenager (Bruno Zanin) and a voluptuous older woman (Maria Antonietta Beluzzi), Amarcord dances on a lovely tightrope between autobiography and fantasy, to the tune of a molto bello score by Nino Rota. Lou Reed supposedly said “I don’t like nostalgia unless it’s mine.” That may very well be true, but it certainly does not apply here: Let Fellini weave his magical web over you. You won’t soon forget it.